Lack of GO Train service is a bit of a sore point for residents of Niagara Region. Local politicians and Chambers of Commerce have worked themselves into a frenzy over the last few years, earnestly presenting proposals and business cases for GO expansion to St. Catharines and Niagara Falls. So, the timing and location of this poster are not optimal. 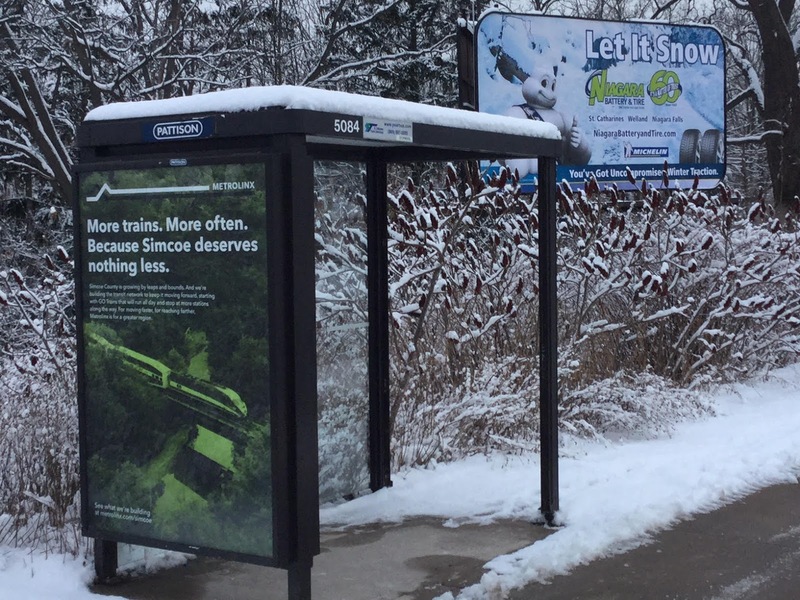 I’m sure though, that it was not the intention of Metrolinx to “rub it in” that Simcoe County is way ahead of Niagara in its quest for more GO Trains. The wording of the ad raises yet more questions, however. There is no doubt that the good people of Barrie “deserve” their new all-day GO Trains. But what did Niagara do, to NOT deserve similar improvements? How did Niagarans end up on the naughty list with Metrolinx, such that they won’t see a weekday GO Train until 2023? Needing the votes, elected politicians will certainly pander to their constituents’ sense of entitlement. However, it was my understanding that Metrolinx is an impartial, non-political agency, making evidence-based decisions that follow principles of professional planning. How could it be then, that the word “deserves” is even in the Metrolinx vocabulary? If transit planning is to be done on the basis of “who deserves what," then Niagara will just have to play the game on those terms. Having been privileged to work in St. Catharines, I may strongly argue that the fine and friendly folks of this community absolutely deserve to be at the front of the line for a first-class connection to downtown Toronto. And we're not talking simply GO Trains; their time has come and gone. Why should Niagarans be forced to suffer the long trip all the way around Lake Ontario, using antiquated 20th century diesel technology, when a superior option exists? The simpler, and preferred solution, is to extend the Line 1 Yonge University Subway directly south, under the lake, to a new St. Catharines City Centre Station. After abandoning TTC Union Station, the new SCCC Station would fit neatly in the loop between King and St Andrew, thus avoiding an inconvenient and onerous transfer for passengers from Niagara. The cross-boundary, underwater portion of the trip would be covered by a regular TTC fare, of course. Perhaps this extra cost to the TTC could be subsidized through some cross-promotional arrangement with Ripley’s Aquarium. Finally, a note to Metrolinx and the TTC: please don’t offer some “study” that suggests that St. Catharines doesn’t “need” a subway. The deserving people of Niagara are rightly suspicious of LRT, fast ferries, swan boats, and other second-rate transit technologies. As they say in Scarborough, nothing but a single-stop "express" subway extension will do! But the Swan Boats will offer a great tourist draw!